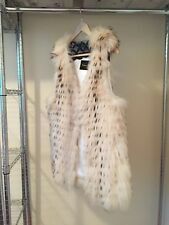 Beautiful real fox fur over-the-hip length vest. White, layered pattern. Please, contact me is You have any questions or need more information. In a good conversation. Length 23 ", arm pit to arm pit 20”, sleeve length 21 ". there are small scuffs, but they are almost invisible. I showed everything in the photos. This size 10/46 Kaufman Franco jacket is in nice lightly used condition. The belt pictured with the jacket is not the original belt but really any thicker style belt would work with the jacket. It is about 24-25" shoulder to bottom. Made in USA. Type of Fur: Mink. Of course, our unmatched selection of archive fashion is only half of the picture without a dedicated team of on-point stylists to back it up. Happy hunting! Material: Fur. Hook and loop closure down fronts, slip hip pockets, cuff on sleeve, very very plush and soft. 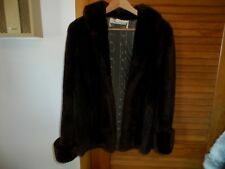 Black brown mink fur coat jacket ! Very high end and Classy! this is all natural, you can see the all natural undertone. Natural color, you all fur fashionistas know how expensive all natural mink is, cos it takes a lot to be able to match the colors naturally! 37" LONG FROM COLLAR TO HEM. 23" SLEEVE LENGTH. 25" PIT TO PIT. KAUFMAN FRANCO. Hidden-snap closure. Flap pockets trim the front. Long sleeves. Fabric: Satin. I try to describe each item in as much detail as possible and I try to take detailed pictures. Approx 31.25" from shoulder to hem and 22" from underarm to underarm. Lining unstitched, 1/2" rip in neck. From shoulder at collar to bottom of coat. From shoulder down to end. One size fits all/most. Across the top. Across the front pit to pit. You double this for all the way around. From the top by hood down to longest point it is 46" on each side. I love this jacket and its angling draping effects! The front has 2 flip up pockets. There are hidden zippers on these front pockets. MADE OF SHEARED MINK. 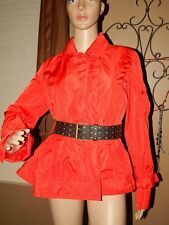 SWING STYLE, Wide CUFFED SLEEVES. SIMPLY ROYALTY FUR COAT. ONE BUTTON AT TOP AND HOOK BAR CLOSURE, LINED. DARK BROWN COLOR. PIT TO PT 22". I'm always open to resolve any problem, until you are satisfied. Albert Kaufman LTD. Initial inside. Shaw collar, full arm holes, tapered sleeves. 26 male plus skins. 55" long and from armpit to armpit is 22" across and the sleeves are 31" long. Used and in good condition. Color : Ivory. You will love this gorgeous coat. Kaufman Franco Gorgoeus Down Coat. Australain 100% wool Comforter (duvet) in 4 sizes: King, Queen,Double, Single. Australian 100% Wool Blanket/Comforter 3 sizes. 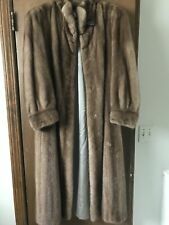 KAUFMAN BROTHERS FASHION CENTER OF EUGENE / SPRINGFIELD OF OREGON MISSES / WOMANS FREE SIZE VINTAGE 60'S �FUR�CAPE /�COAT- MEASUREMENTS LISTED BELOW I AM DESCRIBING THIS COAT TO THE BEST OF MY ABILITY THERE ARE INITIALS EMBROIDERED ON THE INSIDE LINING��"D.E. "� WHICH IS THE PERSON THAT OWNED THIS LOVELY COAT BROWNISH RED IN COLOR FULLY LINED - PLEASE SEE ALL THE PICTURES CAPE STYLE - LONGER IN FRONT THAN IN BACK HIDDEN SIDESEAM HAND POCKETS - WAS TOLD THIS WAS RARE FOR A FUR CAPE? 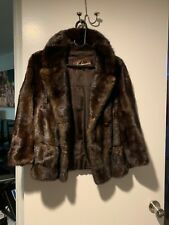 HAS THE "FUR LABEL AUTHORITY" LABEL NUMBERED WITH W895173 WITH THE CAPE LAYING FLAT: LENGTH IN BACK- 20 INCHES, ACROSS THE UNDERARMS- 19 1/2 INCHES.